The Prince Of Dubai Has His Own Country & I Can't Even Pay My Rent! The Crown Prince Of Dubai, Sheikh Hamdan bin Mohammed Al Maktoum, is the second son of Sheikh Mohammed bin Rashid Al Maktoum and Sheikha Hind bint Maktoum bin Juma Al Maktoum. The 36-year-old belongs to a family that is estimated to have a net worth of over 18 billion dollars! He goes by the name of Fazza on Instagram, which translates to the one who helps. He has over 7.7 Million followers on the social media platform. He often melts hearts with his soulful voice as he recites poetry penned by him. But that's not all, Fazza is a horse rider, a skydiver and a diver as well. Is there anything he can't do? After becoming the Crown Prince on 1st February 2008, Fazza took over various duties of the country including becoming the head of Sheikh Mohammed Bin Rashid Establishment for young entrepreneurs. He is also the President of Hamdan Bin Mohammed Smart University, heads the Dubai Sports Council and the Dubai Autism Centre. His passion for the arts led him to establish the Hamdan International Photography Award in 2011. While I spend my days working and sharing memes on Instagram, Fazza's Instagram is proof of his extravagant lifestyle and his love for all things adventurous. 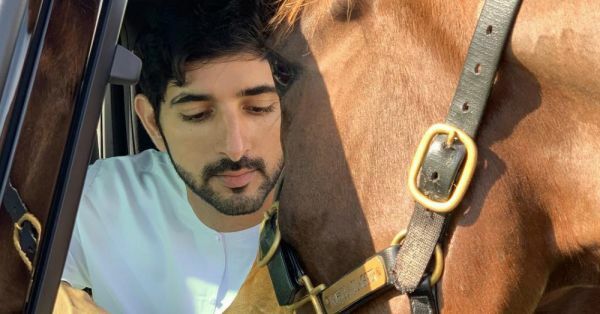 Fazza rescues animals and loves his horses, often referring to them as his best friends. These two beauties are named Koraan Hamdan and Faraan. The Prince of Dubai takes regular diving trips, it's one of his favourite hobbies. The images and videos of his underwater excursions are mesmerizing. One of the first people to try out the zip line in Dubai, he sure seemed to love the adrenaline rush! The Prince of Dubai loves strapping on a GoPro and maneuvering through buildings. I don't know about you but it is scaring the living daylights out of me! Ladies, are you following him yet?